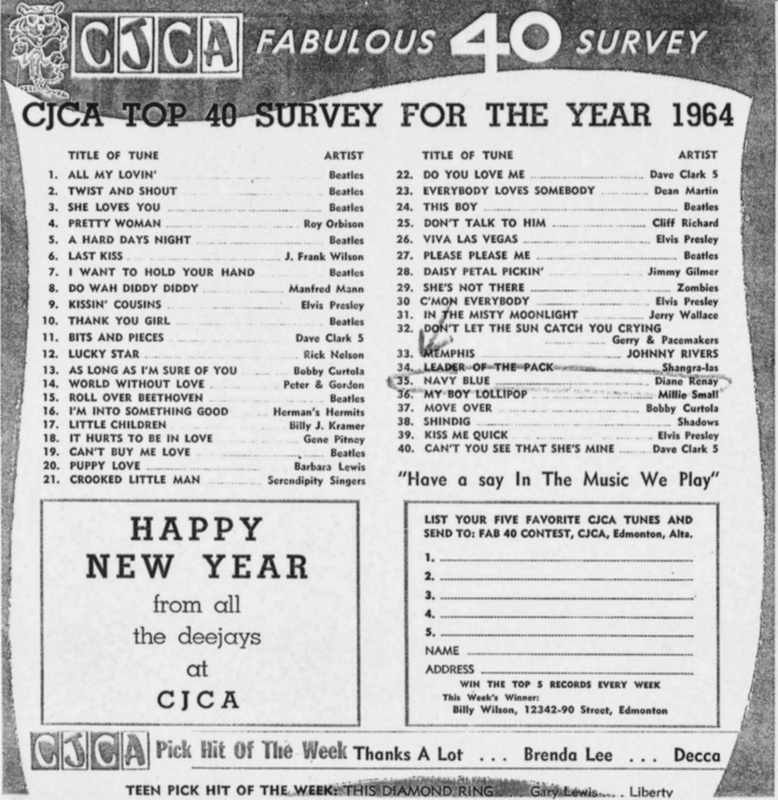 Coming in at #40 ... "Hey Baby" by Bruce Channel (from 1962)! We heard from drummer Clem Cattini during our British Invasion Countdown a few weeks ago. This was their #1 Hit from 1962 ... the first British Group to top the U.S. Charts. Two songs on today's countdown from these Jersey Girls. Although it never officially hit #1 in Billboard (damn you, Singing Nun!) it DID top the charts in both Cash Box and Record World ... and nearly every other city across the country that dared to play it. One of FOUR Chart Toppers for The Polish Prince between 1962 and 1964. Another dance record by this premier dance artist. Instrumentals were big in the early '60's ... and even the champagne sounds of Lawrence Welk made the countdown! One of my favorites by her. OK, we've given Sister Luc-Gabrielle more than her fair share of flack over the years ... and maybe this song deserved some attention for the pure novelty and unusualness of it all ... but #1 for FOUR WEEKS?!?! Man, I'll NEVER get that. America NEEDED The Beatles after this one!!! This was the #1 Song that ushered in the decade. 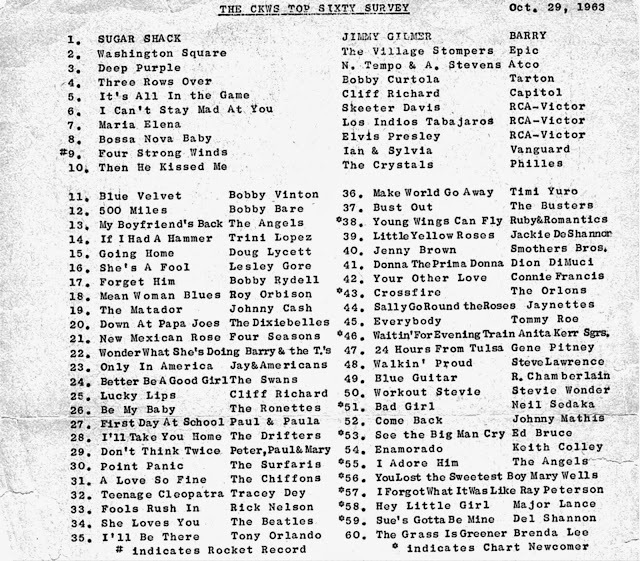 Don't miss The Top 20 Biggest Hits, 1960 - 1963. We TOLDJA it was coming!!! We featured Lesley at the beginning of the week with her 1967 Hit "California Nights" ... but THIS is the one that started it all. Covered by any number of artists over the years, Neil even remade this one himself ... and scored a hit all over again as a slowed-down ballad. Thought by many to be the first rock-and-roll video, Rick's "travelogue" went right to the top of the charts in 1961. Steve and Eydie probably appealed more to our parents than to us teenagers ... but he sure scored a big, teen-aged-size hit with THIS one in 1963! An inspiring tune (especially if you're Bobby "Boris" Pickett)!!! These Jersey Boys went right to #1 with their first three single releases ... and ALL of those were big enough to make this special countdown. Doo-Wop at its finest ... these guys dug out an old chestnut and gave it a whole new spin ... and ended up with the #1 Record in the Country! Another hit for this teen idol. This one sounds just as good today as it did 50 years ago coming out of your radio! More from the folk era. Take it off ... take it ALL off. This has gotta be one of the greatest instrumentals of all time! Chubby has a few dance hits on the countdown ... and this one comes in at #48. How low can you go??? Clearly a Forgotten Hits Favorite, we've featured the song (and the story behind it) numerous times over the years in Forgotten Hits. Sounding a bit dated, it's hard to imagine having the patience to sit through this slow-paced gem even then ... but it was a HUGE hit for these guys. One of those songs that'll never die ... remade by Robert John in the '70's, "The Lion King" in the '90's and N*Sync in the '00's ... is there ANYBODY on the planet who doesn't know (and sing along with) this one??? Peggy was only fifteen years old when this one topped the charts back in 1963! Still one of my all-time favorites by The King. One of the earliest ... and biggest ... teen tragedy songs. More tomorrow ... as our very special countdown hits The Top 40! One of my favorite artists of the late '50's and early '60's, gunned down WAY too soon. The potential of what he might have become was never realized ... and that's just a shame. More Philly Sounds ... this time featuring Len Barry, who would score a HUGE solo hit in 1965 with "1, 2, 3". These guys actually hit the charts before The Beach Boys did ... in fact, Brian Wilson helped write this one ... which launched a whole new surf music phase. A standard that performed well enough on the pop charts to earn the #77 position in our very special countdown. The first chart-topper for our FH Buddy Tommy Roe, who did his part to keep the Buddy Holly sound alive in 1962. Like the Tempo and Stevens hit "Deep Purple", resurrected in the '70's by Donny and Marie. For whatever reason, these two duets seem to be forever linked. The very first 45 I ever bought with my own money ... and the song that launched the career of Brian Hyland. We featured this one a week or two ago as part of our Salute to Folk Music of the '60's. One of my least-favorite Gary Bonds songs ... but his all-time biggest hit. Catching a wave of the surf craze, this one resurfaced in 1966 and became a hit all over again. Our first Motown title ... but definitely not the last! Elvis Is Back ... from the Army ... AND on our Top 100 Countdown! A Halloween classic ... play this one alongside #55 in tomorrow's countdown and see what you think. A novelty classic ... and the song that launched WLS-AM 890 as a Top 40 / Rock Station here in Chicago back in 1960. Written by Gene Pitney, who inexcusably doesn't appear in this special countdown as an artist! More tomorrow ... as the countdown continues. The 1960 - 1963 Countdown Kicks Off Today! This timeless classic (and Brian Wilson favorite) has shown up EVERYWHERE over the years ... TV, movies, advertising ... in 1986 Rocker Eddie Money even got lead singer Ronnie Spector to reprise the "Be My Little Baby" line in his hit song "Take Me Home Tonight"! The Big "O" ... and no, I don't mean Oprah! Later a hit for The Dave Clark Five, this was the original. Cricket from "Hawaiian Eye" had her first solo hit after helping out Edd "Kookie" Byrnes (of "77 Sunset Strip" fame) with his Top Three Smash "Kookie, Kookie, Lend Me Your Comb". Still one of my all-time favorites from this decade. Horton closed out the '50's with his #1 Smash "The Battle Of New Orleans" ... it spent EIGHT WEEKS on top of Billboard's Hot 100 Single Chart! Now he was back, taking a northerly look at the map. Another timeless classic, long out of print until ABKCO finally opened up and shared the Cameo / Parkway Vaults a few years ago. Known by most as an Elvis song (he sang it in "G.I. Blues", his first comeback movie after his stint in the Army), the #1 Hit Record actually belonged to Joe Dowell. One of the original Teen Idols ... and another artist who was able to ride the wave of The Philly Sound. A GREAT Rock And Roll Instrumental ... and one that ANY guitarist worth his salt had to learn at one time or another. A long-forgotten gem by crooner Andy Williams, who left us a short time ago after entertaining us for decades on both the charts and the TV screen. Marcie wished that she was Bobby's Girl ... 20 years later, Rick Springfield wished that he had Jessie's Girl ... proving that teen age lust will never die! Still a haunting sound, even fifty years later! One of my favorites as a kid growing up, Brook normally took a more serious approach with this recordings. Incredibly, he would have one of the biggest hits of his career in 1970 with "Rainy Night In Georgia". The Big O is back with one of his best ... a 1960 smash. There's the first Top 100 Hit in our countdown for Little Miss Dynamite. A #1 Hit from 1963 by a group that originally formed when they were members of The U.S. Marine Corps! A GREAT duet, later brought back to the charts by Donny and Marie ... and I've got to say that I love BOTH versions of this song! The countdown continues tomorrow ... be there or be square! Back to the '60's ... This Week In Forgotten Hits! Contrary to what radio today would lead you to believe, the 1960's did NOT begin in 1964 with The Beatles and The British Invasion. Elvis was back from the Army … and, although he had "cleaned up" quite a bit, he still managed to place 28 songs on Billboard's Hot 100 Singles Chart in that four year period … and all but three of them made The Top 40. In fact, Elvis notched 13 more Top Ten Hits in his King Of Rock And Roll belt … and topped the charts with tracks like "Stuck On You", "It's Now Or Never", "Are You Lonesome Tonight", "Surrender", "Good Luck Charm" … and JUST missed with timeless tracks like "Can't Help Falling In Love" (#2, 1962), the two-sided hit "(Marie's The Name) His Latest Flame" / "Little Sister" (#4 and #5 respectively), "Return To Sender" (#2, 1962) and "(You're The) Devil In Disguise" (#3, 1963). Motown was in its infancy … before the decade was over it would explode and become a driving force in the way America listened to soul music, crossing over to win fans of both black and white young America. Groups like The Four Seasons on the East Coast and The Beach Boys on the West Coast kept both their lead vocals on their hot new sounds HIGH on the charts. In fact, the whole Surf Music Craze had its deepest roots in the 1960 - 1963 era. So did folk music … what has since become known as The Girl Group Sound … The Wall Of Sound from Phil Spector … and the music created in The Brill Building. We had great novelty hits like "Alley Oop", "Itsy Bitsy Teenie Weenie Yellow Polka-Dot Bikini", "Mr. Custer", "Mother-In-Law", "Monster Mash" and "If You Wanna Be Happy", all of which topped the charts … along with classic instrumental hits like "Theme from 'A Summer Place'" (one of the biggest hits of the decade), "Wonderland By Night", "Calcutta", "The Stripper", "Stranger On The Shore" and "Telstar" … Dance Craze Songs that exemplified The Philly Sound like "The Twist", "Let's Twist Again", "Limbo Rock", "The Loco-Motion" and "Peppermint Twist". Feel-Good Songs like "Cathy's Clown", "Everybody's Somebody's Fool", "Stay", "Tossin' And Turnin'", "Hit The Road Jack", "Runaround Sue", "The Lion Sleeps Tonight", "Duke Of Earl", "Hey Baby", "Breaking Up Is Hard To Do", "I Will Follow Him", "It's My Party", "Sugar Shack" and "My Boyfriend's Back". Teen tragedy songs and pining love songs like "Teen Angel" and "Running Bear" … "I'm Sorry" and "Georgia On My Mind" … and songs that just defy description and classification like "Big Bad John", "Sukiyaki", "El Paso", "Travelin' Man" and (what the hell?!?!?) "Dominique"! So a couple of weekends ago, I was flipping thru the channels and I found that MeTV was running an entire one-hour, complete episode of "Batman", the television series ... and not only that, but it was the one that features Lesley Gore as one of Catwoman's hench-ladies ... the episode where Lesley sings her latest hit "California Nights" ... which just happens to be one of Frannie's all-time favorite songs. Naturally, I had to watch the whole thing. How's this for starters ...CALIFORNIA NIGHTS by Lesley Gore, who portrayed Pussycat, one of Catwoman's hench-women in the "That Darn Catwoman" episode. 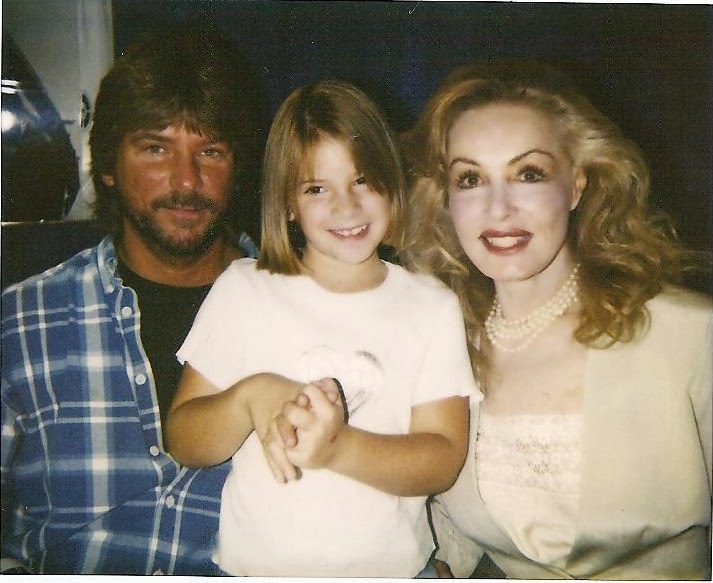 And then, how about WHAT'S NEW PUSSYCAT and "JULIE DO YA LOVE ME" ... along with a vintage shot of me, my daughter Kris and Julie Newmar herself!!! And let's not forget about Batman's sidekick, The Boy Wonder! Was I a Batman fan? You betcha! 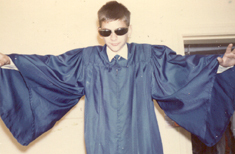 Check out my Grade School Graduation Picture!!! I never quite got this next one ... but it works for me ... and, incredibly, this was a Top 20 Hit in 1967! That was Whistling Jack Smith ... who was, of course, Kaiser Bill's Batman. And let's not forget THESE two!!! There's your Six Degrees ... or would that be THIRTEEN Degrees ... of Separation ... Gotham Style!!! Congratulations on all of the well-deserved accolades you have received in the presentation of the superlative Burton Cummings interview in Forgotten Hits ... as with a song, you can tell when it's a hit! I'm sure Burton Cummings, his Manager Lorne Saifer, and Tour-Manager Sam Boyd must be very pleased with the results and its content. What a great preface to what I'm sure will be one of the best music shows to hit Chicago this year! Burton Cummings' voice and compositions and their longevity speak for themselves. By the way, you mentioned you were in the printing business -- I was wondering if you called your company "The Artist Formerly Known As Prints!" Great interview again Kent, love Forgotten Hits -- continued growth and success! LOL ... hey, I like that!!! (If I could ever figure out a way how to make it in the "music business", I would most certainly adopt that moniker as"The Artist Formerly Known As Prints"!!! I love it! We're still getting comments about our Top 100 British Invasion Hits (1964 - 1965) Countdown, too ... including this week, a unique look back at The British Invasion from a Canadian perspective! 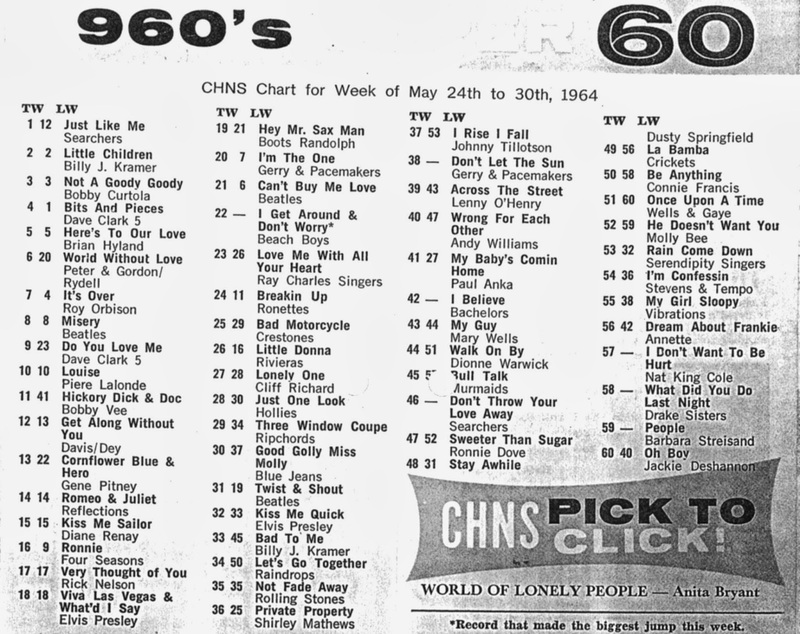 Actually, if you want to talk about the hype that is the "British Invasion" in the very early '64 era, you might look at the weekly Hot 100's and see that the DC5 were first to be added, but after that it was mostly US acts singing ABOUT the Beatles. We had the Carefrees and Donna Lynn, the Swans, and the 4 Preps ... all doing songs ABOUT the Beatles (along with Bobby Vee's Beatlesque "I'll Make You Mine" containing the "woo" shaking heads bit from his touring with the fabs in UK earlier) ... all of this occurred before others jumped into the mix that were FROM Britain. These songs fueled the fire. It was mostly "Beatlemania" rather than the British Invasion in the beginning. That DID fuel the fire quickly and finally, in March, the Searchers helped start the flood. One other record from England started the same week. For the Besch brothers, the Swingin' Blue Jeans were what started the British Invasion for us in full swing. We had heard the DC5's "Glad All Over" first, but it did not SOUND like the Beatles. It was "Hippy Hippy Shake" that really got us all wondering what was going on. Stations were putting out rumors that this was possibly actually the Beatles, too. There were SO many Beatles records out already on various labels that it was entirely feasible to us. Add to it that the Fabs had recorded the song themselves on the BBC earlier. The sound was unmistakably Beatles-esque. Whatever the case, it was a great memorable time. I agree that Cliff Richard had some GREAT songs that just never made it big here in the States. "Green Light" was his attempt at a second "Devil Woman" and I loved that tune. One that ties in with the British Invasion stories is the B side to the August, 1964, Epic 45 "Bachelor Boy." "Boy" was the A side and was Cliff's typical styled song, but if you flipped it over, you heard his best attempt at Beatlemania-sound. "True, True Lovin'" has that Beatles' version "Dizzy Miss Lizzie" sound with Cliff's trademark vocal sound. We had quite a bit of discussion regarding The Seekers when our Top 100 British Invasion Hits ran ... now comes news that a reunion tour may be in the works! If you check out this week's new addition to Reel Radio, you can hear Peter and Gordon echoing your thoughts on the British Invasion being a lot of US songwriter covers early on. Some interesting comments by Peter and Gordon on the Stagg Line! You can also catch two of our fave Chicago bands blasting out two of their more obscure 1966 sides on the Sound 10 Survey countdown. Hip Hip Hooray WCFL! One thing I noticed as I reviewed your countdown of the Top 100 British Invasion hits is how many of them were remakes. By my count, 27 of the 100 had first been done by someone else before the Brits had hits with them ... more than a quarter of them. There was PLENTY of innovative songwriting during the British Invasion years, but the number of remakes shows, I think, that style was almost as important as substance then. It is not often that I have cause to get out my Canadian radio charts, but I often have found them fascinating and with the above comments as well as Burton Cummings weighing in, I thought I'd throw these at you and Bruce Spizer and your Canadian readers. Here's quite an exciting quandary for you guys that I have always wondered about. 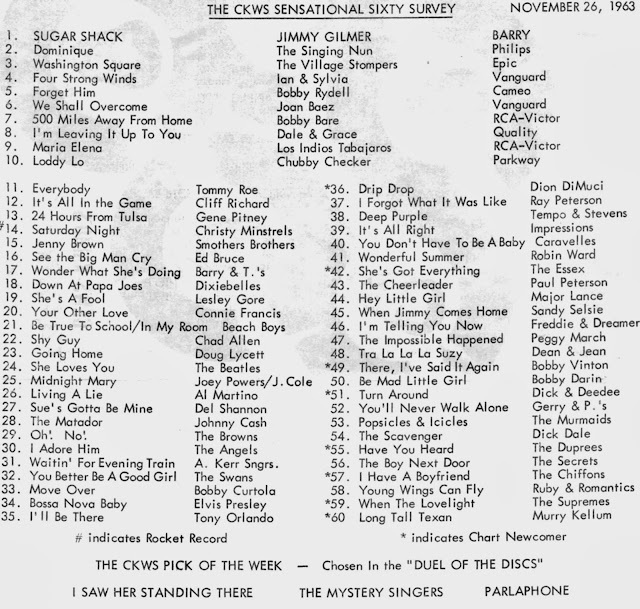 I have an extensive CKWS Kingston, Ontario, Canada survey collection from late 1963 thru 1964. The station was pretty strong at 10,000 watts daytime and 5000 night just across the northeastern edge of Lake Ontario from New York state, a mere 50 miles north of Syracuse, NY. 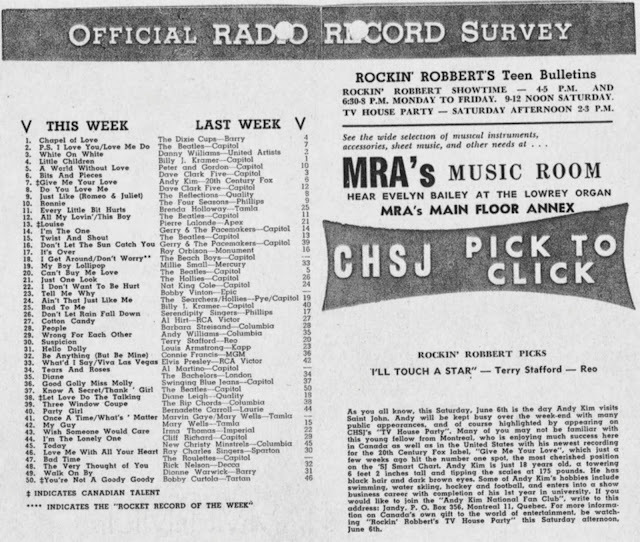 It's very possible that New Yorkers were catching the Beatles tunes earlier than most US listeners if they caught Canadian stations. Actually, the eastern US folks MAY have heard the earlier 63 Beatles singles before Canadians, as I have not seen any Canadian charts other than western Vancouver's CFUN (near Seattle) listing Beatles songs prior to "She Loves You." Overall, Canada seemed only a month ahead of the US in hearing the Brit Invasion songs, but often charted songs OTHER than ones that hit here. The CKWS Oct 29, 1963, chart shows "She Loves You" as a non-new song at #34 with a UK issue date of late August and a Swan US date of mid-September release. The Brit star of that day was Cliff Richard holding #5 and #25 on this chart. I will mention that between the above chart and the November 26, 1963 chart, "She Loves You" meandered around the mid-20's as it would until it drops off in late December at about the time Beatlemania would strike the North American continent. SO, the Beatles were not an instantaneous smash in Canada either. The November 26th chart IS interesting from other points. 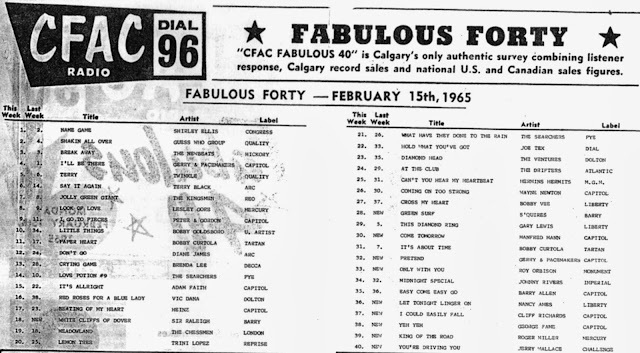 Besides "She Loves You" at #24, Freddie & Dreamers jump in at #46 with "I'm Telling You Now" which US Capitol DID release in October, 1963 (before the Beatles US releases! ), but reissued as a #1 US hit single much later on Tower subsidiary. The VERRRRY odd thing is noting the "Pick of the Week" being "I Saw Her Standing There" by the "Mystery Singers" on Parlophone! Obviously, this was the Beatles, but why the mystery?? I don't THINK the song was issued on 45 in Canada before 1964 and the Beatles were not big yet, so I wonder what was going on there?? 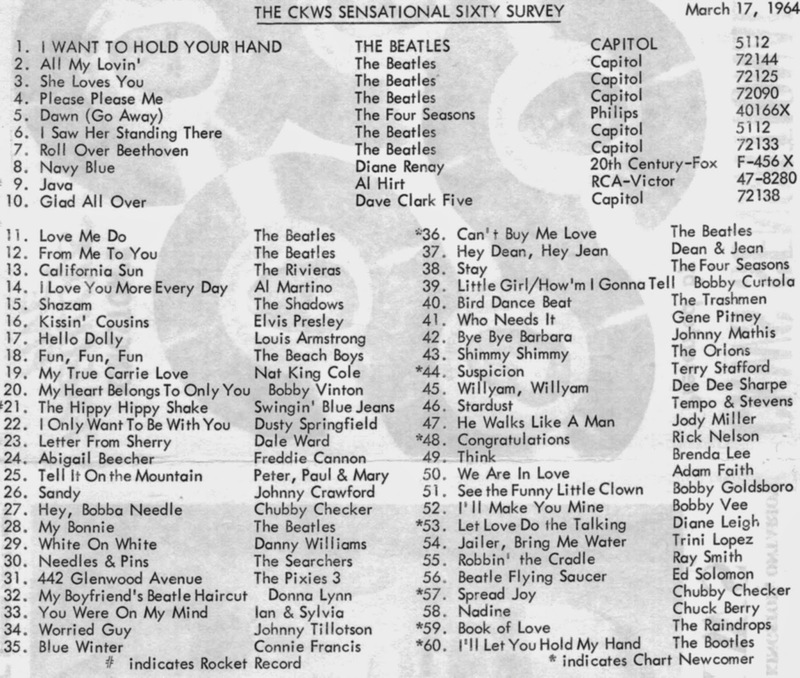 The March 17, 1964 chart shows Beatlemania in full swing, as well as "Capitol-mania". Capitol OWNED the Canadian disc market it seemed. A side note that maybe the US chose the wrong songs to release, as "All My Lovin'" was huge in Canada and was imported over to US market. Note "She Loves You" back on the CKWS chart at #3. It actually returned right at the beginning of 1964 after about a week off the chart. SO, "She Loves You" was basically a CKWS chart rider from October, 1963 until it finally fell of in May, 1964! Hmm, "Beatle Flying Saucer" at #56?? Must be like the Buchanon and Goodman "Invasion" 45 in the US about that time. Bootles at #60 -- a girl group most likely. 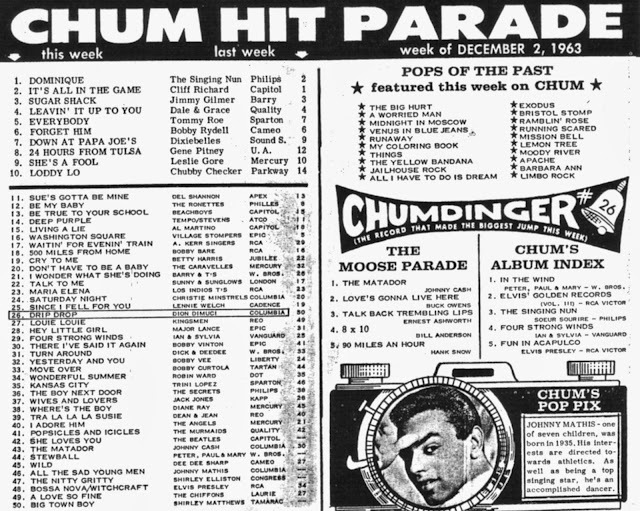 Next, a CHUM chart showing the debut of "She Loves You" at #42 on 12/2/63. Cliff sits at #2, but all this above Beatlemania is slow to get to the 1050 AM juggernaut out of Toronto that can be heard across the US. By May, 1964, Beatlemania AND the Brit Invasion is widespread in Canada. CHNS 960 in Halifax, Nova Scotia (directly EAST of Maine) was a strong 10,000 day / night station that was airing MANY UK charters that did not do well in the US. Check out #1, #8 (!!! ), #27, #28, #30, #35. Note a couple of CHICAGO rockers going well at #25 and #26!! CHSJ 1150 St. John, New Brunswick, Canada (100 miles NE of Bangor, Maine) was another 10,000 watt day / night AM station. Altho not shown here, this chart is from 6/13/1964. This one is great to see the Capitol Records dominance in Canada with UK and US artists. 20 of the top 50 on Capitol including the Hollies taking on the Searchers at #24. Even the Roulettes were on Capitol! 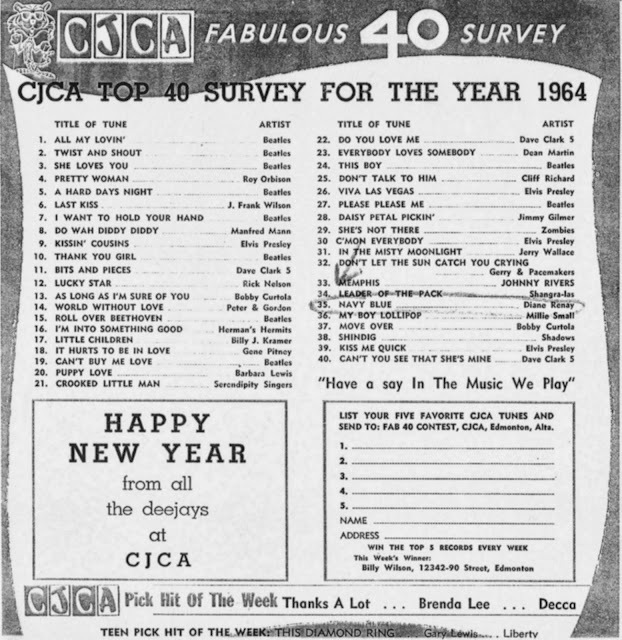 Montreal born Andy Kim gets some GREAT press in 1964 with his #7 record as well personal TV appearances on CHSJ-TV teen TV show (see to right of survey), well before he hit it big in 1968. 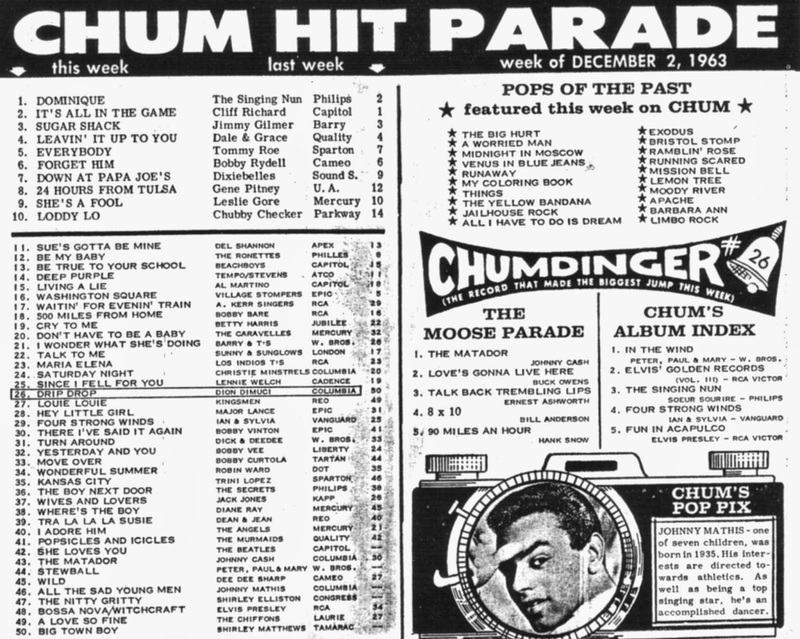 CHUM chose to ignore his minor successes mostly, until 1968. CJCA 930 was a 10,000 watt day / 5000 night station in Edmunton, Alberta (200 miles north of of the western / northern Montana border). 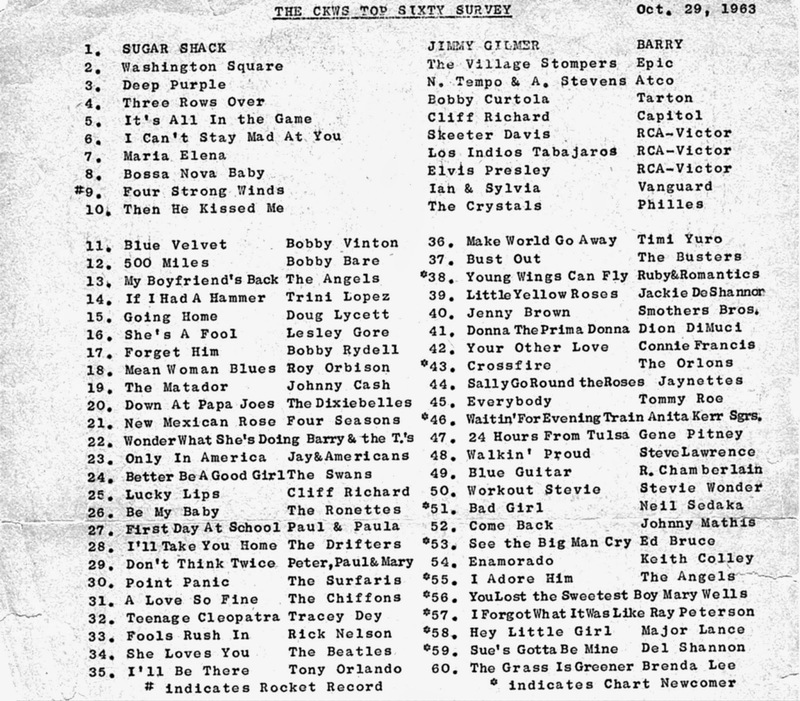 This is their top 40 for the entire year of 1964 issued 1/5/65. Note that "All My Loving" was the BIGGEST Fabs hit in that area. Look at the Brit dominance here. CFAC is a 10,000 watt day / night Calgary 960 station (250 miles NE of Spokane, Washington). 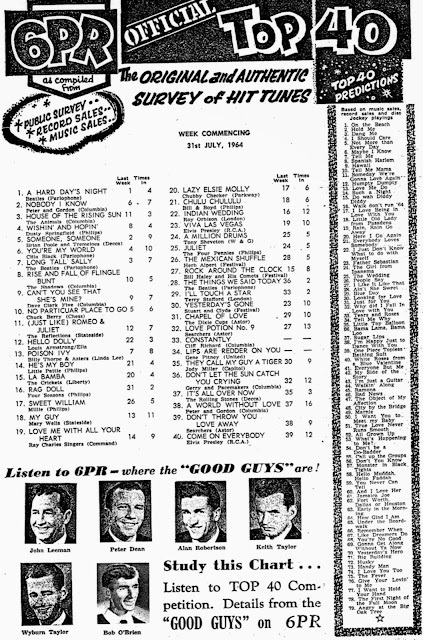 Here's a 1965 chart showing the Guess Who rockin' in at #2 amidst the hits of the day. The song would not be a US chart rider for months to come! Lastly, a 6PR Perth, Australia chart from summer 1964 showing lots of Brit influence, but surprisingly more US charters than one might expect?? Shortly after taking over the role of manager of her mother, Carole King, in mid-2011, Sherry Goffin Kondor looked over a list, left by the departed manager. "It was things that needed to be taken care of," she said. "And one of the things on the checklist was, 'Go and see the reading of the musical and kill it. Carole's not into it." The musical was "Beautiful," which tells the story of one of the most celebrated composers and singers in pop history; a woman who wrote (with her lyricist husband, Gerry Goffin) dozens of major hit songs in the '60s and '70s, including "Natural Woman," "Will You Love Me Tomorrow," "Up on the Roof," "You've Got a Friend" and "Chains," which was covered by a band of admirers called the Beatles. In the late '60s, King emerged as a singer, and her 1971 album, "Tapestry," stayed on the charts for an astounding 68 weeks, helping to pave the way for the era of the singer-songwriter. "Beautiful: The Carole King Musical" will open this month at the Curran Theatre in a "pre-Broadway world premiere." It moves to New York for previews before its Broadway opening in January at the Stephen Sondheim Theater. In other words, Sherry Kondor didn't kill it. "I think she always had a level of discomfort about having her story told by someone else, and (having) her story shrunk down to the scope of a play. Lorna (Guess, the previous manager) had urged her to at least try it, with this writer and that writer, and each time it was underwhelming. So I went into it thinking it's not going to work. I'll go to this reading and then have to break the news." "I watched the reading, and I'm charmed. I laugh, I cry. I called my mother. 'Mom, I don't want to kill this. This is really good.' I thought, there's great potential there, and we should let it grow. She said, 'OK. I'm trusting you.' "
Kondor gave the producers the go-ahead, along with some notes for writer Doug McGrath ("Bullets Over Broadway" with Woody Allen, "Infamous" and "Emma"). When it was time for another reading, Kondor persuaded her reluctant mother to go with her to a rehearsal space in Times Square. "We'll sit in the back," Kondor told her. "I won't let anyone talk to you." They stayed through the first act. "And at intermission she said, 'I'm leaving.' What? I imagined all these people would ask, 'Why'd she leave?' She said, 'I think it's really good. I just can't watch my life like this.' I said, 'OK. Understood.' And everyone else understood." King, who is not doing interviews in advance of "Beautiful," sent this message to The Chronicle: "I've always been a very private person, so initially I was horrified by the idea of my life being turned into a musical. The period chronicled in 'Beautiful' was exhilarating in so many ways, not the least of which was being stimulated creatively by Gerry Goffin, Barry Mann and Cynthia Weil, but it also included some of the most painful moments of my life. "After Sherry saw an early workshop, she encouraged me to attend a reading. Hearing it aloud in a room full of people left me conflicted. I had to leave after the first act because the excellence of the writing and the actors' interpretation awakened long-buried emotions. But the artist in me realized how good the show was, and I knew I couldn't stand in its way. I gave 'Beautiful' its title, which has multiple layers of meaning for me, and now I give 'Beautiful' my blessing." In fact, King cooperated with writer McGrath soon after he was hired, in 2009. "She came to my office and allowed me to ask anything I wanted," he said. "I led her through her life. She was generous in openly and honestly telling me what happened and how she felt: her doubts, fears and strength. But then, 'That's it. I've given you everything I have.' " King then turned to writing her memoirs ("A Natural Woman," published last year). McGrath came aboard after several failed attempts at a Goffin-King-based musical, dating back nine years. "Early on, somebody tried a musical in the 'Mamma Mia' mode," he said. "They took the catalog and made up a fictional story to fit the songs. Ours is the opposite of that. Their catalog is most interesting in the context of their personal story." McGrath was hired despite having no professional experience with musicals, said Christine Russell, Goffin's manager, because "we just wanted the right storyteller." That story, as King said, dealt with some painful moments, including her divorce from Goffin and his straying into hard drugs. It helped, Russell said, when McGrath came up with the idea of focusing not only on Goffin and King, but also on their friends, another husband-and-wife team of composers, Mann and Weil. "That made Gerry and Carole feel more comfortable," she said. "Gerry's story is pretty intense," Weil said. "In a sense," Mann added, "Cynthia and I have become the comic relief in the show." Mann (music) and Weil (words) composed "You've Lost That Lovin' Feelin'," the most often played song in pop music history. Their credits also include "On Broadway," "We've Gotta Get Out of This Place," "Walking in the Rain," "Uptown" and "He's Sure the Boy I Love." The two couples often worked in adjacent, tiny offices at 1650 Broadway, a block or so away from the fabled Brill Building. There, they and a dozen other composers cranked out pop tunes for Aldon Music, a publishing company that pitted the teams against each other to come up with the next hit for the next big group. "Beautiful," McGrath said, "is about them and their best friends who were just on the other side of the wall. It's about these four humans - the incredible talent, the competition and friendship they had, the blindness to certain faults in another person, the ability to love and forgive." The fierce competitiveness depicted in "Beautiful" was real. Writers heard each other's songs through common walls. The atmosphere, King noted in her memoirs, "didn't exactly foster inventiveness." Weil agreed: "It just fostered thievery!" She quickly added that she was joking. King will be portrayed by Jessie Mueller, a Tony nominee for her work in "On a Clear Day You Can See Forever" in 2011. Kondor saw Mueller's audition. "There was something about her when she came into the room," she said. "She just had the same sunny, sweet energy that my mom has. I said, 'Yes, she could play my mom.' "
When "Beautiful" opens at the Curran, Mann and Weil plan to be there. Goffin, who is ailing, hopes to catch a performance. As for King, her daughter said it was unlikely she will attend opening night, but will "sneak in at some time." It'll be nerve-racking, no doubt, for all of them. Beautiful: The Carole King Musical: Opens Saturday. Through Oct. 20. $50-$210. Curran Theatre, 445 Geary St., S.F. (888) 746-1799. www.shnsf.com. Carole King will join the ranks of Bruce Springsteen, Paul McCartney and Barbra Streisand to be celebrated in January as the 2014 MusiCares Person of the Year. Two nights before the GRAMMY Awards, King will be honored at a star-studded gala in Los Angeles. On January 24, the Dixie Chicks, Lady Gaga, Bette Midler, Jason Mraz, James Taylor and Steven Tyler will take the stage to perform and honor the singer. Additional artists will be announced in the coming months. King is being honored for her charitable work. The singer-songwriter is involved with several environmental organizations. She has worked with the Alliance for the Wild Rockies since 1990 as well as other groups in fighting the passage of the Northern Rockies Ecosystem Protection Act. If you want to pass on my email address to the person looking for the Mel Blanc stuff I believe I have it. I think I also may have the Return to Paper Plates, and at least some of The Story Lady episodes. I won't vouch for tip top quality but they are certainly listenable if they are still in the dungeon, which I think they are. I have reached out for help on this. I do know that things were a little different that night due to the hospitalization of Buddy's drummer, but the line-up itself may have been the same. Anyway, let's see what comes up. Looking for the b-side song ... something like oop oobioe do … unsure of the a side … Four Seasons maybe? Can you help? Do you recall a song of which part of the lyrics go, "As long as you love me, we can fly"? It may have been an early '70s song, but I am not certain. I actually thought the group Chase had recorded that one, but I did not find it on YouTube. Just my curious self, inquiring. Marvin Rainwater, who had the 1957 Hit with "Gonna Find Me A Bluebird" (#22) passed away last week. Early on in this series, we mentioned that we would be featuring One Hit Wonder recording artist MARVIN RAINWATER. In fact, MARVIN is one of the VERY few artists featured this month who is actually of American Indian descent. His OWN style could best be described as country and early rock-a-billy and when country legend RED FOLEY heard him perform an old HANK WILLIAMS tune, he invited MARVIN to join his OZARK JUBILEE radio program. RAINWATER continued recording throughout the '50's but never again encountered the type of chart success that BLUEBIRD brought him. In 1959, he developed some throat problems, drastically affecting his vocal abilities. In 1980, he told GOLDMINE MAGAZINE, "I didn't know it then, but I had calluses on my vocal cords and should have quit for months. Instead, we'd spend hours and hours in the studio (recording "do-overs") without ever getting anything decent." After finally recognizing what the REAL problem was, RAINWATER had throat surgery and then resumed his singing career, going on to record for a variety of record labels into the '70's (including WARWICK, UNITED ARTISTS, WARNER BROTHERS, BRAVE and WESCO.) Much of his rock-a-billy work has since be repackaged and released via Germany's BEAR FAMILY RECORDS, and MARVIN has remained very popular overseas. (Early in his career, RAINWATER cut some 50 rock-a-billy tunes for a local Washington, D.C. studio owner, who then pedaled these tunes to a variety of budget record labels like SPIN-O-RAMA, CROWN and PREMIER once MARVIN reached some chart success with MGM. RAINWATER claims he never authorized these songs to be released ... nor did he earn a penny in royalties for their sale.) While RAINWATER today is considered a classic rock-a-billy artist (he's even in The Rock-A-Billy Hall Of Fame), his biggest hit, GONNA FIND ME A BLUEBIRD is most decidedly COUNTRY (rather than rock, pop or rock-a-billy) in nature. DIDJAKNOW? : Although he never hit The Top 40 again, MARVIN RAINWATER DID have a couple of other chart hits ... including a song titled HALF-BREED, which peaked at #66 in 1959. (No relation to the CHER hit we featured a couple of weeks ago.) It was, however, a #16 Country Hit ... and was written by JOHN D. LOUDERMILK! In fact, MARVIN RAINWATER was the very first artist to record LOUDERMILK's INDIAN RESERVATION ... then titled PALE-FACED INDIAN ... back in 1959, SEVERAL years before DON FARDON and PAUL REVERE AND THE RAIDERS took a crack at the tune. (You may recall that this was the very first song that we featured in this special HONEST INJUN tribute ... don't you just LOVE it when all this stuff ties together?!?!?!) In fact, thanks to the amazing THEONEBUFF, we have this rare MARVIN RAINWATER track to share with you today. Jerry Osborne wrote an interesting article about Sixto Rodriquez. (See below) The 2nd link is a live performance and the 3rd link is about Detroit. (InnerCity Blues). I just watched the Oscar winning documentary about him "Searching For Sugar Man" and the story is perhaps the most unique story regarding a musician in the 70's and 80's. Amazing he stays in Detroit when he's such a sensation around the world. 'Searching for Sugarman' as you describe, in my opinion is a great and poignant movie. I have watched it several times. He is like no other person in the industry and his mystique will always be captivating. WARNING: Listening to Eagles music can be hazardous to your health!!! Vernett Bader of North Charleston, SC was tired of listening to her roommate play the Eagles. So, she grabbed a serrated knife from the kitchen and began to stab him. After she told him she didn't want to listen to the band. He responded by telling her to shut up and continued playing his music. It’s something that presumably only happens in the movies, but this time it was all too real for a South Carolina man. Yesterday (September 16) Vernett Bader of North Charleston, SC was tired of listening to her roommate play the Eagles. So, she grabbed a serrated knife from the kitchen and began to stab him. After she told him she didn’t want to listen to the band. He responded by telling her to shut up and continued playing his music. The police report states that when her roommate and his brother took the knife away from her, she went back into the kitchen and got another. Police claim all three were intoxicated at the time of arrest. Bader was charged with domestic violence of a high and aggravated nature. Her male roommate was found with stab wounds on his arm, hand and elbow, police report. The police report did not state what Eagles song was playing at the time of the incident. The Eagles will be the first band to perform at the newly renovated L.A. Forum when the iconic music venue reopens in January in Los Angeles. The Eagles will bring their ‘History of the Eagles’ show to the venue for three nights on January 15, 17 and 18. The venue, owned by The Madison Square Garden Company, has recently been given a $100 million make-over bringing in state-of-the-art technology and amenities and creating the largest indoor venue in America. The make-over includes a new 8,000 square feet hospitality area separated from the arena with a tinted wall. The Eagles have been touring The History of the Eagles shows with former member Bernie Leadon who played with them on the first three albums. Leadon co-wrote the classic Witchy Woman. The current tour also features his song Train Leaves Here This Morning in the opening moments of the show. Tickets go on sale to the general public beginning September 28 at 10 AM through LiveNation.com, Ticketmaster.com, at all Ticketmaster locations, through Ticketmaster charge-by-phone at 1-800-745-3000 and Ticketmaster Express at 866-448-7849 (automated only self-service line). And this just in ... a review of The Eagles' performance here in Chicago last night, courtesy of Tom Cuddy ... man, I can't WAIT to see this show!!! "Seems like a dream now, it was so long ago." The Eagles are the definitive American rock band. Outside of the Beach Boys, no other American act even comes close to matching the ups, the downs, the good, the bad, the spot on music of life quite like the Eagles. They did their first of two nights (they will appear for their second night in Chicago on October 19 at the All-State Arena) in Chicago at the United Center on Friday, September 20 in front of a sold-out crowd of hard-core fans; and a few nominal fans. Don Henley and Glenn Frey are two gifted composers / lyricists and they took the stage in silence and it went from you could hear a pin drop to a deafening roar of approval. The lovers of the timeless music catalog known as the Eagles were beyond content. They opened the show with two little heard ballads from their first two albums. Train Leaves Here This Morning is off the 1972 debut album, Eagles. That lovely piece of music segues into Saturday Night off of the Desperado album. No band defines musicality better than the Eagles. They were and are gifted songwriters, musicians, singers and clearly, the best harmonizers in all of recorded music. Lest one think hyperbole is being used. It's not. Original member, Bernie Leadon rejoins the Eagles on this, Their History of the Eagles tour. Even though we are being led to believe and I believe it is true, that this will be their last tour as Eagles, it is wonderful to have him back. He plays the mandolin on Saturday Night and it is beyond a welcomed moment in life itself. The only missing element is Randy Meisner. Randy Meisner's ill health has prevented him from taking part in this retrospective of a career. Glenn Frey did say from the stage that Randy was recovering. Unfortunately, his nuanced and beautiful presence on the stage will not be felt during this tour. The acoustic open to the show with the earliest of Eagles songs is beautifully done. No theatrics. It's the music. Period. They play through a near mind-numbing series of hit songs. Peaceful Easy Feeling,Witchy Woman, Tequila Sunrise, Best of My Love, Already Gone and One of These Nights. They launched into a scorchingly subtle, beautifully poetic and hauntingly cow jumped over the moon moment with their non-Randy Meisner version of Take It To The Limit. Randy Meisner is obviously not there to craft and mold the moment that only he can take to the limit, but the memories of the original recorded version are so deeply rooted in the mindset of the lover of the music that it will no doubt never fade away during the earthly life of the fan. The current stage version of Witchy Woman is newly arranged with a driving downbeat. It took on a life of its own. Bernie Leadon, in his intro said he wrote the song with Don Henley and then got a laugh out loud moment with "no one in the band ever dated anyone like this woman." One of them probably did. More hits - Lyin' Eyes, New Kid in Town, Life in the Fast Lane, In The City,Heartache Tonight and then they rolled us into a post hypnotic trance on their encore songs, including Hotel California, Take It Easy and they move quietly into the sunset with the most gorgeous and simple take on Desperado. They play it straight with the original arrangements of many of these songs, but they mess around (in a good way) with Heartache Tonight. Glenn Frey admits he loved what the Beach Boys did with Barbara Ann. A group of musicians having fun with their guitars talking to one another. There were no heartaches last night. Lots of humor and talking on this tour. I've seen them several times over the years and they talked more last night than they have in their entire career on the stage. Frey had some good moments with his Lyin' Eyes tune dedicated to his ex-wife. I won't give you the punch line. Those Shoes was so spot on I literally could have closed my eyes and thought my turntable was playing my Long Run copy. Joe Walsh adds a tremendous amount of humor and rock to the evening. His superb artistry with the guitar lends itself wisely to the band. His inclusion in the band may be one of the most brilliant decisions Glenn Frey ever made. By the way, he looks great. Talk about aging well. Joe's highlight moment was Rocky Mountain Way. You get a Colorado backdrop to ease you while showcasing his still remarkable set of gifts. Timothy B. Schmidt off of a bout with cancer is in top form. He drives home the appeal of the country rock roots and he delivers on the hard driving rock songs. Don Henley and Glenn Frey still offer supremely worthwhile lead vocals throughout the multiple sets, although, keep in mind they are 66 and 65 years of age respectively. No, they don't sing like they used to, but they are better than anyone else out there under the age of 30. Their voices have to strain a bit and they are no longer effortless voices. They are two of the finest vocalists, phrasers and interpreters of their own music in the last sixty years of recorded music. Song for song, there is no act quite like them. The Beatles may reign with range and depth, but for sheer joy, solace and peace in rock/pop music I would rather have the catalog of the Eagles on the desert island, wherever that may be. On a cold and lonely day I'm pulling out On the Border. I don't say this lightly, but in my life I have been comforted deeply by my faith, my immediate family and by the music that has so stirred my emotions. The Eagles have been with me on my own personal journey since that lofty late spring day when I first heard them back in May, 1972. I sincerely can't imagine not having them as my backdrop. I shared this evening with my two surviving siblings. I also had two elementary school friends join in. The evening was like a walk into my youth. Amen to that! In the end, it was much more than a walk backwards. It was a walk into my very present life and ultimately, a walk into the future. The music of the Eagles will be with me until I take my own last breath. Oh yeah, "the bluebird was high on the wind." This show is something to behold. May they have the wind be at their back as they loiter effortlessly through the balance of their days.